A few observations from the fine new movie Selma: Martin Luther King sometimes ate ravenously. He had difficult conversations with his wife, a woman forced to deal with matters as ominous as death threats while wondering about his relationships with other women. Like many busy men, he spent too much time away from his family, and he became the symbol for a movement that would have gone nowhere without the hard work of many others. On occasion, he smoked cigarettes. All that’s tactfully shown by director Ava DuVernay. DuVernay’s movie also makes it clear that King’s rhetoric soared and inspired a nation, that he often put his body on the line to advance the cause of justice and that he understood how to move public opinion. He was the prophet who stood outside the gates of power, urging the powerful to help the long arc of the moral universe bend toward justice, as he might have put it. For all that, Selma isn’t a King biopic: It’s an entirely absorbing look at the landmark 1965 civil rights march from Selma to Montgomery, Ala. Stirring and sobering, Selma enables us to feel the urgency and complications of a moment when the wheel of history definitely was turning. DuVernay surely knew that Dr. King already has been enshrined in the sacred pantheon of American greats. She’s interested in the man who fought for civil rights, not the icon created by a self-congratulatory culture that belatedly lauds him. As played by the gifted British actor David Oyelowo, Dr. King never wavers about his goal — in this case gaining voting rights for black people in the Jim Crow South. He strategizes, looks for the best ways to dramatize each protest and bring repression to the forefront of American consciousness. On occasion, he’s beset by doubt, not about the cause, but about what he’s asking others to sacrifice. The first attempt to cross the bridge, of course, resulted in brutal attacks on 600 peaceful marchers by state and local law enforcement officials. DuVernay doesn’t flinch from that violent reality, either. These bridge scenes are mini-masterpieces of tension in which DuVernay makes terrific use of silence to create a sense of fearful anticipation. She allows us to feel what it must have been like for the marchers to see armed men — some on horseback — awaiting them on the other side of the bridge. In Washington, a frustrated Johnson expresses annoyance with King for insisting on a voting rights bill so soon after Johnson had pushed a Civil Rights Bill through Congress. Eventually, the movie suggests, Johnson unleashed J. Edgar Hoover of the FBI (Dylan Baker) in an attempt to embarrass King with a purported recording of a sexual encounter. The recording was delivered to Mrs. King. You may have read that this Johnson/Hoover alliance, along with other matters concerning LBJ, has been disputed by some. Don’t let these criticisms sway you from the movie. Selma recognizes the scope of a movement that climbed the ladder of power. It shows disagreements that sometimes tore at the civil rights movement from within, but also how its force rippled all the way to the White House. I’d argue that DuVernay appreciates the difference between a president and someone who’s pushing that president to act. History, of course, is seldom as tidy as we’d like in to be. Young black activists from the Student Non-Violent Coordinating Committee had been working in Selma before King and his Southern Christian Leadership contingent arrived. Initially, they viewed King as a celebrity interloper, a man who wanted to cash in on the grunt work they’d been doing. King knew they had a point, but also understood that the movement needed a figurehead and a voice. He thought he and his colleagues were best suited to calling attention to a movement based on a three-part approach that already had produced results: negotiation, demonstration and resistance. The days leading up to Selma were full of stark contrasts. Perhaps that’s why DuVernay begins in 1964 with Dr. King receiving the Nobel Prize in Oslo. He shares a fancy hotel room with his wife Coretta (Carmen Ejogo). Oyelowo’s subtly tuned performance picks up the irony of the situation — he’s enjoying comfort in Norway while many were suffering at home. Oyelowo lets us know that King realizes that his work isn’t finished. His eyes are on a bigger prize than any that could be awarded in Europe. DuVernay takes us from Stockholm to the Birmingham bombing that resulted in the death of four black girls. She then shows us obstacles put in the way of Annie Lee Cooper (Oprah Winfrey), a black woman who’s trying to register to vote in Selma. Cooper is given a ridiculous qualifying test in which she’s asked to name every county judge in Alabama. Working from a screenplay by Paul Webb, DuVernay evokes a potent feeling for the time — its ugliness, its idealism, its internecine battles, its heroism and breadth. King may have endured his dark nights of the soul, but he also was a great man, and his speeches (adapted here from originals) still produce goose bumps. It doesn’t take a perfect man to speak to the conscience of a nation. It takes a man who’s brilliant, brave and right about the justness of his cause. Many of the supporting performances are spot on. Tim Roth, for example, makes a convincingly appalling George Wallace, the Alabama governor who thought he just might be shrewd enough outfox Lyndon Johnson. Selma also introduces the supporting cast that surrounded Dr. King, figures such as Andrew Young (Andre Holland), Diane Nash (Tessa Thompson), Rev. Hosea Williams (Wendell Pierce) and John Lewis (Stephan James). As you look at DuVernay’s images of the march, you’ll be reminded of an important truth. Prominent figures are seen leading marchers across the Pettus Bridge. But when demonstrators finally headed for Montgomery, it wasn’t the people in the front of the line who turned a protest into a movement. It was everyone who marched along — taking the rest of the country with them. 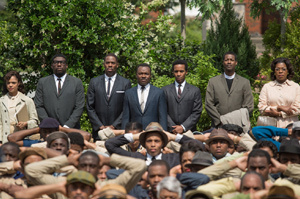 Selma serves as a look at a fascinating collection of real-life characters, as an ultra-dramatic rendering of a tumultuous moment and perhaps as a goad: The march may not look the same today, but there’s still much to overcome.